Hoya is a group (genus) of plants that belong to the Milkweed family, Asclepiadaceae. We can say that Hoyas are vines, which most are. However, there are species that are more bush-like. Most twine and climb up tree trunks or amongst large shrubs, but then there are many that are pendant, hanging down over large limbs, exposing their dangling stems to the monsoon winds of the moist tropics. Most Hoyas are found as epiphytes and usually hang in the branches and crowns of tall jungle trees seeking sunlight. Many start their life in the dampness of the tropic forest floor; there is one section of the genus that remains primarily terrestrial, for the most part. Wind borne seeds that germinate in this dampness on the forest floor, but especially the climbers, find their way up stems, tree trunks and branches, to eventually die out below and find life support above. Many seeds germinate but only a few establish themselves and grow to become massive vines or clumps. Hoyas are native to many exotic places. Their westward extension begins on the island of Sri Lanka (Ceylon), off the southwestern coast of India. They are found in peninsular India, the upper Ghats region, the Punjab, Simla and in Sikkim, around Kolimpong in the foothill region of the Himalayas and to the East in the Kasi and Naga hill country. From here then eastward into Burma, Thailand, Southern China, Laos, Cambodia and Vietnam. There are species found on Taiwan and the Japanese Island of Okinawa. Numerous species are found on the 1,400 or so islands of Philippines. Home is also in Sumatra, Indonesia, other islands of Indonesia, including all of Borneo, the Celebes and New Guinea, and Malaysia. In Australia around Darwin facing the Arafura Sea, on to Cape York and down the east coastal area south to Northern New South Wales. From the Australian mainland and across the main island of New Guinea they are found on all the lesser islands of New Ireland, New Britain, Bougainville and on down the islands of the Solomon chain, and South to Vanuatu (New Hebrides) and New Caledonia. They are at home even further to the east in the many islands of the Fiji group, and on to Tonga and the Samoan Islands. In the American Trust territories of Truck and Ponapae, in the central pacific, one species had been found in each location. The genus was named for Mr. Thomas Hoy, the intelligent and successful cultivator of wide renown, who worked for the Duke of Northumberland at Scion House, England. The word hoya is the Latinization of Mr. Hoy’s name. Each hoya seems to have some distinctive and outstanding character. In the case of this hoya, it is the striking foliage. The leaves are thick and rigid, elliptic with narrowing bases. Most of all, it is recognized by the contrast between the light-green leaves with prominent deep emerald-green venation and the deep green edge to each leaf. They are spectacular; they stand out. The plant would, in my estimation, be worth growing for the foliage alone. In its native environment, it is not a common plant. It comes from the Malay peninsula, South Thailand, the island of Borneo and Sumatra, Indonesia. Here, it can be found along rivers and streams in the lowland forests and clearing edges. 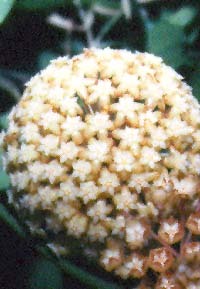 The flower clusters are pendant or stick out sideways in compact balls of reflexed waxy flowers. The corolla is pubescent on the inside otherwise glabrous. The centers are creamy white with some yellow tones and contrast well with the bronze-maroon reflexed petal lobes. Flowers are about one half inch in diameter with 35 in the cluster. Its flowers give off a sharp spicy fragrance. This plant is a conversation piece and another species you will surely want in your collection. The soft appearance of the foliage along with the dark green veins attract you immediately to this plant. The leaves are large, often twice as large as our picture shows; they are covered with soft hairs (pubescence). The green is an unusual shade; I'd say a medium deep emerald-green, set off with very dark green venation. The new leaves are bronze-green in color. The stems, especially on new growth, are a bronze purple. These maroon-like tones add a pleasant addition to an already beautiful plant. This is a cold tolerant plant that comes to us originally from the island of Hainan, off the south coast of China. If necessary, Hoya fungii along with Hoya carnosa types and the Hoya compacta types, can survive the cold months with less heat than most hoyas. Fifty degrees F. would be fine. It will actually take temperatures lower than this, but it will be happy in the cold periods with the fifty degrees temperatures. In addition to the beautiful foliage, the most outstanding feature of this plant is its globular clusters of ± 60 flowers. They are much like Hoya carnosa clusters, but with twice as many flowers. I find that normally the individual flowers are slightly larger than carnosa flowers. My flowers are always open a little deeper pink in color than our photo depicts. This plant is a medium strong grower, so plan on it occupying considerable space as it matures. Curl the long stems around the pot and hanger to keep it confined and to give a more compact form. I would say that given time and space this species would be a must for most growers. It is very easy to grow and easy to bring into bloom. If you are familiar with growing Hoya carnosa, this one should be a natural for you. As I have said, the flower clusters are larger, its foliage unique and very attractive. Combine these qualities with its tolerance for cold and you have a plant that will fit into a wide range of acceptable conditions, one that is likely to win your heart. The "Sweetheart" or "Valentine" hoya is a very old standby. The original plant came to us from Thailand and grew in the jungles of Doi Sootep at 390 meters altitude. This is an area up near Chiang Mai. It is also found throughout the Indo-China area. Its thick succulent leaves are heart shaped giving rise to its common names. It is so fleshy that no veins are visible in most clones. The leaves of Hoya kerrii are large and opposite as with the majority of hoya species. The plant is an extremely vigorous climber and needs lots of room to grow. It roots readily at the nodes and along the stems in moist conditions, making it an adaptable climber in its native habitats. I think it could easily be listed as the most vigorous of all hoyas. Undoubtedly, you will have to tend this one to keep it in bounds. A wire tomato cage or a wooden trellis might be helpful. The umbels of Hoya macgregorii are spectacular. 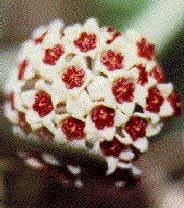 They are large globose clusters of 120 or more flowers per umbel, more than any other hoya species. It has a spicy sharp fragrance. The plant is a vigorous vine, so give it lots of room to grow -- it will need the space. Hoya macgregorii has lanceolate-elliptic, glabrous and waxy leaves. The leaves are rather leathery and deep green, about 3-5 inches long and 1-2 inches wide. For those who can grow their plants outdoors all year long this makes an excellent subject for growing free up a tree or other support. For this purpose it is good because of the large amount of flowering clusters it will develop given a free existence. The foliage here is thick and fleshy, ovate to elliptic-lanceolate with flat margins. The upper surface is a very deep green, dull because of a rough surface. The undersurface is much lighter green, covered with fine punctations of a slightly lighter color. Here and there on this lower face are distinguishing black spots. The leaves are thick and rigid and the venation is not visible except for the midrib. The stems are wiry and also very dark, a very deep brown or maybe with purple mixed in. This species is vigorous but not large or sprawling. It branches freely, blooms well and is an attractive, different plant. Nearly pest-free, due to its’ hard surfaces, no doubt. At a quick glance, the flowers remind one of Hoya lacunosa Blume or Hoya obscura Burton. The flowers here are a soft fuzzy rose color in rather loose flat umbels. 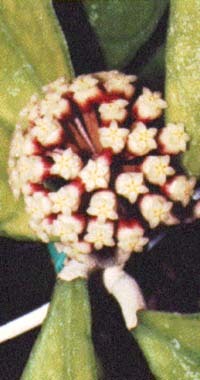 As an Acanthostemma species, it is closely related to Hoya inconspicua Hemsley from the Solomon Islands; Hoya incurvula Schlechter from the Celebes, Indonesia or Hoya davidcummingii Kloppenburg from the Philippines. This species is, however from India, Thailand and surrounding areas. I like Hoya micrantha because it is a tough, rugged plant. Even when I have really neglected it, this hoya continued to grow and thrive, and never failed to bloom in spite of my carelessness. It is somewhat stiff and wiry to the touch. I keep saying add this to your collection. Most have beautiful flowers, all have interesting foliage and some, like this one, are just downright rugged individuals. Although it is vigorous it is not a large plant, therefore such a small pot will accommodate it nicely. It loves to twine and climb so will need your attention to keep it in bounds. One advantage is you will always have some long runners to cut off and give to friends as cuttings if they admire your plant. This new species is a vigorous fine-stemmed vining and much branched plant. The foliage is opposite, linearly lanceolate with an acute apex and cuneate to slightly rounded base, where a distinct gland is present. The leaves are very distinctive, of a deep dull (flat color) iridescent green, due to an extremely fine velvety upper surface. Venation is somewhat obscure but pinnate with veins at 45 ° to the midrib (noted when dry). Leaf edges are entire but with slight undulations, the edges being slightly turned under. The foliage is profuse. 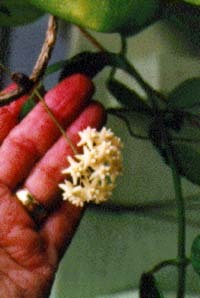 The flowers are on relatively long peduncles. 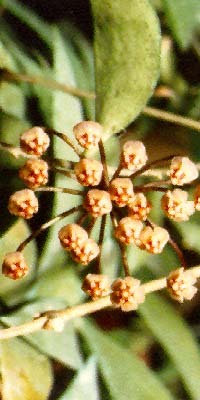 The semi ovate clusters of small yellow flowers resemble small Hoya darwinii Loher flowers. The deeply cut corolla form lobes that are recurved backward and rolled on the edges to give a starry appearance to the flower. 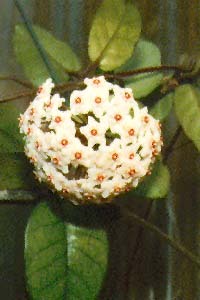 Actually the upper surface has a very fine pubescence, thus differing from the much larger flower of Hoya darwinii. The crown is of a similar pale yellow color with the outer coronal lobes raised. There is slightly darker color in the deep center, otherwise the flower is of a uniform color. There are about 15 flowers to each umbel. The flower is fragrant with a dull scent, not spicy or sharp. This species will quickly make a nice full plant in a short time from cuttings. I feel it is suitable for a 6 inch hanging basket, at least until it is a couple of years old. It should be an ideal indoor light-garden plant for indoor culture. Keep this one damp and in a good loose potting mix. Enough good things can't be said about this outstanding Philippine species. In addition to being a vigorous well-leaved species, and clean, it makes an excellent pot plant, indoors or out. The flower clusters are spectacular and a mature plant may bloom with many umbels open at the same time. It is also a repeat bloomer. One other favorable characteristic is its cold hardiness, similar to that of Hoya carnosa R. Brown. This does not mean to imply that either can stay outdoors all winter long in temperate zones but it does mean that it will take colder weather better than most other hoya species. It will undoubtedly survive better than most in an unheated room. I feel this is one species no one should be without. Several pubicalyx selections appear below. In addition to all the good attributes of the species itself, this type of variegated plant can be a true eye catcher and a valued conversation piece. As a chimera (a special type of variegation which arises because of a complex of different tissue types), the plant is full of surprises. The lush glossy foliage, silvered as with the species can exhibit irregular sections of purplish colored leaf tissue especially visible on the young growth and newly formed leaves. 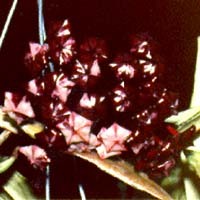 The new stems are most often purplish brown as is the leaf petiole and often the leaf midrib. When it blooms you are in for further surprises. Flowers of mixed colors are not unusual, one may see numerous color mixing within one flower as well as within flowers in the globular clusters. Each cluster may appear different with occasional clusters of very dark almost black flowers, others with lighter bright rose or deep pink. The top photo shows a cluster with the flowers not yet open and yet the various colors of the chimera are evident. It is fun to look for branches exhibiting special coloring patterns and select them for cuttings to start new and improved plants. I do not believe you will ever grow tired of this plant variety. Be the envy of all your plant growing friends when it comes into bloom; this is an awesome, "must-have" Hoya. Another outstanding Hoya pubicalyx selection, this plant was a seedling selection made by Dale Kloppenburg and named for his mother. Same great deep rose, fragrant pubicalyx flowers, with dark green, narrow, compact, glossy slivered foliage. Excellent strong, compact growth habit. Choice. Cuttings are two nodes unless otherwise noted. if not in stock, may require two to three weeks to root.